Are you an undergraduate or graduate student in an exercise science-related field looking to build the skills necessary to become a great Strength & Conditioning Coach? If this sounds like you - you've come to the right place! 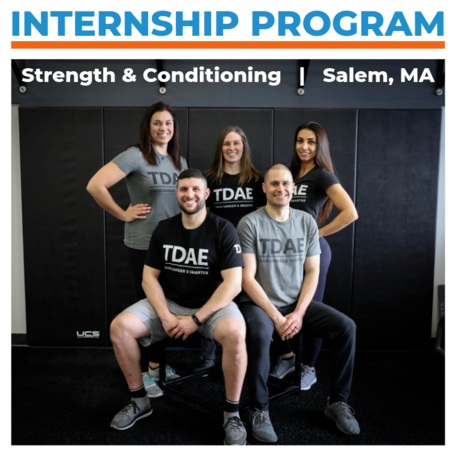 Our experienced and qualified staff of Strength & Conditioning Coaches is committed to giving back to field and making it a better place through our educational internship program. Our team has experience working in a wide variety of settings, including professional sports, collegiate sports, high school sports, sports medicine and the private sports performance training setting. We are proud of the community we have built here in Salem, Massachusetts. If you can see yourself becoming a part of our community while building up your coaching, communication and program design skills, please feel free to submit your application. ©2019 TD Athletes Edge. Website Design & Development by Infinite Communications Inc. All rights reserved.